New for July 2018! 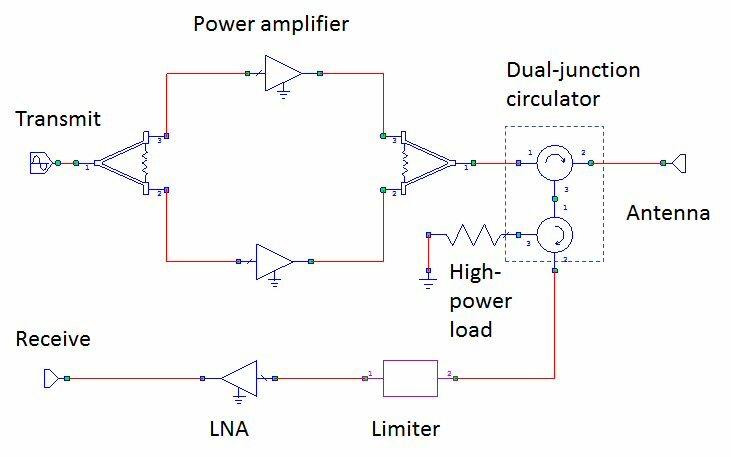 Dual-junction circulators are used in duplexing transmitter/receiver to antenna, in radar applications. The purpose of the second junction is to isolate the power amplifier from seeing a poor impedance match and preventing load pull which could blind your radar. Many comms systems use a diplexer scheme, because transmit and receive are separated in frequency. Dual junction circulators are often used in high-end T/R modules where cost is over-ruled by performance (for example fighter jets). The second junction is used as an isolator, so that the power amplifier sees a good impedance match under all conditions. The two junctions are tied together into a four-port network. There's at least two ways to configure the dual junction circulator. Below, the two junctions are placed in series with the transmit signal. If the antenna shows a poor match, some signal bounces back and hits the limiter. 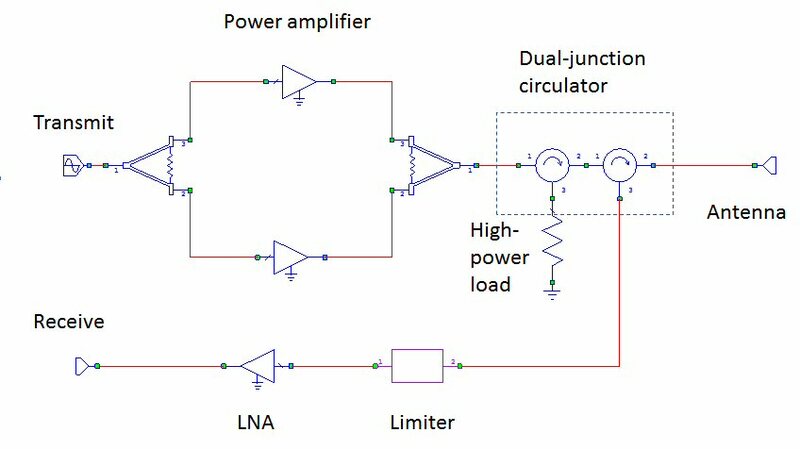 Under high-power conditions, the limiter may behave like a short circuit to protect the LNA, and passes the reflected signal back to the transmitter. However, that second junction traps the signal into a high-power load. The down side to this configuration is that both junctions have to be rated for full TX power. Also, the LNA will not be immune to source pull (degrading noise figure due to impedance mismatch) in this configuration, but source pull is generally not as bad as load pull. A second option is shown below. Here, the second junction is installed in the receive path. Once again, when a signal reflects from the antenna, it bounces from the limiter back into the high-power load. If you are only worried about poor antenna match (say, -6 dB), the second junction does not have to handle as much power as the junction that is attached to the transmit chain. But if you are designing for idiot-proofing, you might consider that the system could be hooked up with the antenna disconnected: in this case both junctions need to handle full rated power. Also, the LNA in this configuration is protected from source pull.